Lineage. Established as 476 Fighter Group on 20 Apr 1943. Activated on 19 May 1943. Disbanded on 31 Jul 1943. Reestablished on 11 Oct 1943. Activated on 1 Dec 1943. Disbanded on 1 Apr 1944. 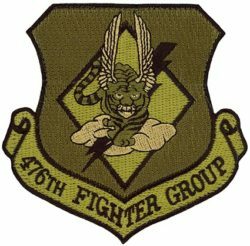 Reestablished and redesignated 476 Fighter Group (Air Defense) on 11 Dec 1956. Activated on 8 Feb 1957. Discontinued on 1 Apr 1960. Redesignated: 476 Tactical Fighter Group on 31 Jul 1985; 476 Fighter Group on 6 Jan 2009. Activated on 1 Feb 2009. Assignments. Fourteenth Air Force, 19 May-31 Jul 1943. First Air Force, 1 Dec 1943; Second Air Force, 26 Mar-1 Apr 1944. 29 Air Division, 8 Feb 1957-1 Apr 1960. 442 Fighter Wing, 1 Feb 2009-. Operational Components. Squadrons. 13 Fighter Interceptor: 1 Jul 1959-1 Apr 1960. 76 Fighter: 1 Feb 2009-. 453 Fighter: 1 Dec 1943-1 Apr 1944. 541 Fighter: 1 Dec 1943-1 Apr 1944. 542 Fighter: 1 Dec 1943-1 Apr 1944. 543 Fighter: 1 Dec 1943-1 Apr 1944. Stations. Kunming, China, 19 May-31 Jul 1943. Richmond AAB, 1 Dec 1943; Pocatello AAFld, ID, 26 Mar-1 Apr 1944. Glasgow AFB, MT, 8 Feb 1957-1 Apr 1960. Moody AFB, GA, 1 Feb 2009-. Aircraft. None, 1943-1944. F-86, 1959-1960; F-101, 1959-1960. Operations. Activated in China on 19 May 1943; disbanded two months later. Reactivated in the US on 1 Dec 1943 as a replacement training unit with four squadrons assigned; squadrons apparently did not become operational and group disbanded on 1 Apr 1944. Activated again on 8 Feb 1957; involved in activation of Glasgow AFB, MT; did not operate as a separate unit until 9 Mar 1959; trained air defense crews through inactivation on 1 Apr 1960. Campaign Streamers. World War II: China Defensive. Emblem. Approved 18 May 2010.